I semi-retired from the banking business ( March 1, 1996), and following a consulting assignment in late 2009, began working full time as the EVP/COO of First Asian Bank. 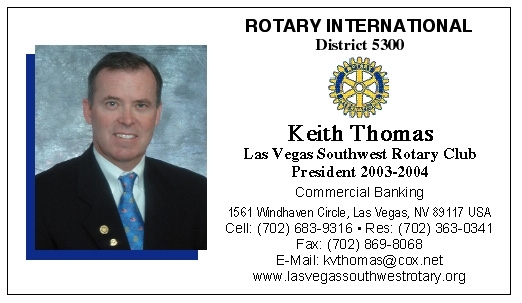 I am currently a director (and past president) of my Rotary Club, I previously served as the VP of membership and currently serve as a director of the Las Vegas Area Council of the BSA, and am an emeritus director/treasurer of the Nevada Community Foundation. I served as a "Service Missionary" in the Nevada Las Vegas West Mission office for almost 2 1/2 years (2/01 to 7/03) as the Housing Coordinator and, from time to time, finance coordinator, statistics coordinator, etc., etc. I have been serving as a "Humanitarian Service Missionary" in Las Vegas since being released in 10/07 as bishop of the Monte Cristo Ward.